Solar panels being installed at Blackfriars Bridge. Photo credit: Solarcentury. As a Londoner, you would be excused if solar power was a fairly abstract concept. Whilst solar power has flourished in many parts of the UK, London has lagged behind for many years due to the complexity of operating in urban environments and the prevalence of rented accommodation. Last year, Green Party London Assembly member Jenny Jones released a report concluding that the London region has the lowest uptake of solar power in mainland UK, with only one in 260 households investing in solar installations as opposed to the South West where one in 32 households have gone solar. Bucking the trend, one of the world’s largest solar companies, Solarcentury, in January 2014 boldly officially unveiled the world’s largest solar bridge in London. 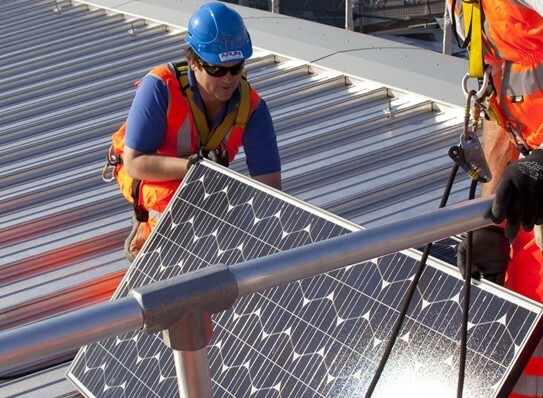 An impressive total of 4,400 solar panels were mounted on the newly modernised Blackfriars railway station, estimated to be able to supply up to 50% of the station’s energy needs. A year and a half down the line, how have the panels performed and have they met expectations? Donna Mitchell from Network Rail told me that according to the latest readings available, the panels generated 865 megawatt hours (MWh) of clean energy between September 2013 – July 2014, which equated to 25% of the station’s energy needs. However when I put to her why it was 25% and not 50% as previously stated, she explained that at peak times (days with most sunshine hours) it indeed produced 50% of the stations electricity, but balanced across the year it averages to 25%. To put this into perspective how much electricity that is, it equates to the average yearly electricity usage of approximately 207 UK homes or 80,000 cups of tea a day. Network Rail have in fact set themselves the target of reducing their carbon intensity with 14% by 2019, which means the race to green London’s railway stations is very much on. In 2012, Kings Cross railway station also received a solar facelift. In this case, solar cells were integrated into 1392 glass laminate roof units. Whilst this project generates 175 MWh per year, this only equates roughly a fifth of the energy generated by the Blackfriars project. Between these two railway infrastructure projects, both have shaved an impressive 100 and 500 tons, respectively, off London’s CO2 emissions. Surprisingly, it was actually in the City of London that the first large scale London solar project was born. In 2011, the Heron Tower, then the tallest building in the City of London, also integrated solar cells into laminated glass in window panels. Heron Tower currently produces 92.5 MWh of energy a year, just over half of what the Kings Cross installation produces. And further to this, my sources tell me that another large scale London solar project will be announced this summer. Maybe solar cells integrated in windows could be a feature Londoners could enjoy more off in years to come? Scientists have already produced transparent solar cells barely noticeable to the naked eye, which are becoming increasingly commercially viable by the day. These types of solar cells could be installed in windows across the city and completely revolutionise how solar power is used. Whilst the residential solar revolution has so far struggled to take off in London, technological breakthroughs and ambitious solar projects could be starting to remove London from the bottom of the UK’s solar league table.